B.R.C. Roofing has been proudly servicing Maine & New Hampshire for over 60 years. We specialize in flat and steep sloped roofing. B.R.C. Roofing specializes in seamless gutters. B.R.C. Roofing is a Certified Roofing contractor with GAF. A distinction given to 6% roofers Nationwide. 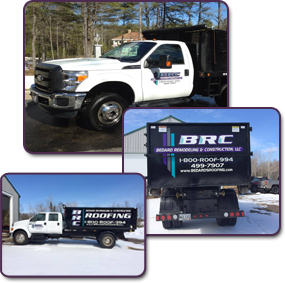 It is with great pleasure that we welcome you to B.R.C Roofing and to our website; your New Hampshire and Southern Maine roofing company specialists for more than six decades. Helping our clients find the cause of all unwelcome water ingression, we take great pride in diagnosing the symptoms as well as finding a long-lasting solutions and prevention plan our clients need. From simple repairs to total system replacements, our team specializes in flat and steep slope roofing for both residential and commercial structures. We are a GAF Factory Certified Southern Maine roofing company. Because of GAFs stringent standards, we pride ourselves on providing an exceptional level of installation service, knowledge, and expertise to our clients. At B.R.C Roofing, our roofing services include residential re-roofing services, commercial and residential flat roof installation, metal roofing and flashing, chimney flashing, replacement of roof decking, seamless gutters, and snow and ice removal programs. Our products include metal, asphalt, wood shake, and rubber roofing EDPM and accompanying materials. Whether you are looking for a small repair or complete re-roofing, our team of specialists are dedicated to providing the highest level of service and professionalism in the business. As industry leaders, we set the standards for workmanship, attention to detail, and adherence to manufacturer and industry approved roofing practices. To learn more about our services and background, please do not hesitate to contact us at your convenience. We are B.R.C Roofing, your leading Kennebunk, Maine roofing company!